One of the more interesting aspects of The 100 has been the steady shift from portraying the original 100 as victims of violence to perpetrators of it. The show has slyly (and not so slyly) crafted a seasons-long narrative that has seen just about every single main character presented with a difficult decision that tests their moral compass. More specifically, the show has presented Clarke, Bellamy, and a few others with the option of saving some of their own people while killing others in the process. That kind of moral grey area has been the driving force behind The 100 since the very first season. It’s given weight and depth to occasionally familiar plots, and that’s allowed the show to stand out from the crowd of dystopian/fantasy/sci-fi shows. I mention all of this because “Red Sky At Morning” presents the idea that perhaps Clarke, Bellamy, Octavia, and everyone else from the Sky People are so surrounded by death that they don’t even realize when they’re doing more harm than good. Violence has been naturalized for them; day-to-day, it’s part of their lives. As Harper muses right before she enjoys a (naked, adorable) moment with Monty, do the original 100 just spend their time sitting around waiting for the next attack, the next bit of death and destruction? It sure seems like it. Everywhere they go violence and death follows. “Red Sky At Morning” deals with this idea as A.L.I.E. infiltrates the oilrig where Luna and her people are living safely—Luna tells Octavia that they only accept people who have stopped fighting—and begins to take over, adding more members to her City Of Light army. 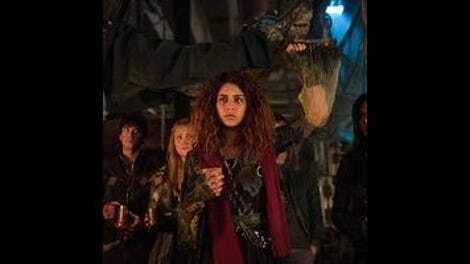 The interactions between Clarke and Luna, and Octavia and Luna, provide a necessary shift in perspective. 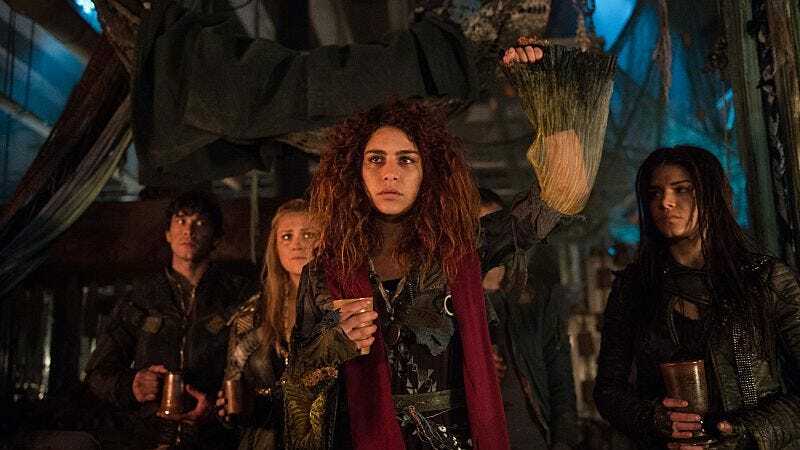 For nearly three seasons we’ve been watching the Sky People struggle to survive, whether it’s warring with the Grounders or working towards peace, however unstable it might be. So, the people on the oilrig serve a distinct purpose: they present another way of life, casting the main characters in a much harsher light. When Clarke tries, for the third time, to convince Luna to take the Flame, Luna balks at the idea that Clarke is any different than anyone else who will do anything for their people. Clarke is playing the victim, but Luna doesn’t see it that way. She just sees another person bent on war and destruction, another person pushing the mantra of “blood must have blood” whether they’re willing to admit it or not. That’s a fascinating shift in perspective that’s underscored when Clarke tries to forcefully attach the AI to Luna and is promptly taken down. In that situation Clarke comes across as desperate to save her people, but also morally in the wrong. She’s attempting to force Luna on her side, and that’s not too far removed from being a dictator like Pike. She’s essentially saying she knows what’s best, but as Luna points out, she just brings death wherever she goes. Octavia knows it too. “This place was safe until we got here” she says. Again, this is a good area to explore, but “Red Sky At Morning” doesn’t go far enough. Instead, the characters are questioned, they cause more death and destruction (so many innocent dead bodies on that oil rig), and then head back home. That’s not enough, plain and simple. While the episode’s exploration of the negative impact of the Sky People doesn’t really go far enough, there’s enough actions and intrigue in “Red Sky At Morning” to make it one of the more memorable episodes of the season. In particular, the episode is a showing for Raven, as she almost single-handedly takes down A.L.I.E. before falling just short. The whole sequence where she hacks into her Citadel and finds the kill switch is thrilling. The camera flashes back and forth between Raven frantically looking for a way to destroy the threat while Jaha and A.L.I.E. panic within the City Of Light, trying to figure out a way to stop the mission. The result is that A.L.I.E. disconnects from Arkadia, thwarting Raven’s plan but also weakening her army. It’s a win, but a small one, especially as Monty has to relive the death of his mother thanks to A.L.I.E.’s cold, manipulative behavior. Essentially, The 100 is really struggling to find depth in this season. There’s been a ton of action, and the show excels at those sequences. It knows how to use camera angles, lighting, and music cues to increase tension and the feeling of paranoia, and the performances remain as solid as ever. “Red Sky At Morning” is spot-on in terms of its action sequences, from Raven’s manic hacking to the extended torture sequence leading to Luna killing her best friend. The problem is, there’s no emotional or thematic anchor here. For all the talk of pain and suffering and the relief offered by the City Of Light, the show still refuses to meaningfully engage with its most challenging ideas. When Murphy is faced with potentially destroying Emori, there’s no weight behind the decision. It’s a problem with the City Of Light storyline in general; if we know so little about how the City Of Light works, how can we be emotionally invested in the lives being lost inside the City? The 100 isn’t sure how to answer that question. “Red Sky At Morning” is often thrilling, but the depth that defined past seasons of The 100 is still missing. I could have used a little more lead up to the Monty-Harper moment, but I’m not about to deny them some happiness. I want more of Luna. What a badass. Everything with Pike, Indra, and Murphy is just table setting for the last two episodes. Not a whole lot going on there. I still don’t like that the show wants us to see Pike in a different light though. Another area I wish the show would explore a bit more: how Clarke and the gang are essentially trying to kill their own people. Clarke kind of mentions it here, but there’s the potential for so much more.